Roast rava in a pan or for 2 minutes in microwave. Take a pan and heat oil. Add urad dal and sauté it till it turns light brown. Add curry leaves and onions and sauté it for 3-4 minutes till onions become translucent. Add peas, carrots, green chillies, capsicum, curd, salt and 2 glass of water. Let it come to the boiling point, switch the gas stove on medium flame and let it simmer till the vegetables are almost cooked. 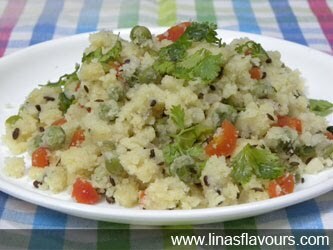 Sprinkle roasted rava slowly while stirring it continuously with spatula to avoid lumps. Pour all the rava like this. Close the lid and let it cook for 3-4 minutes, stirring occasionally.